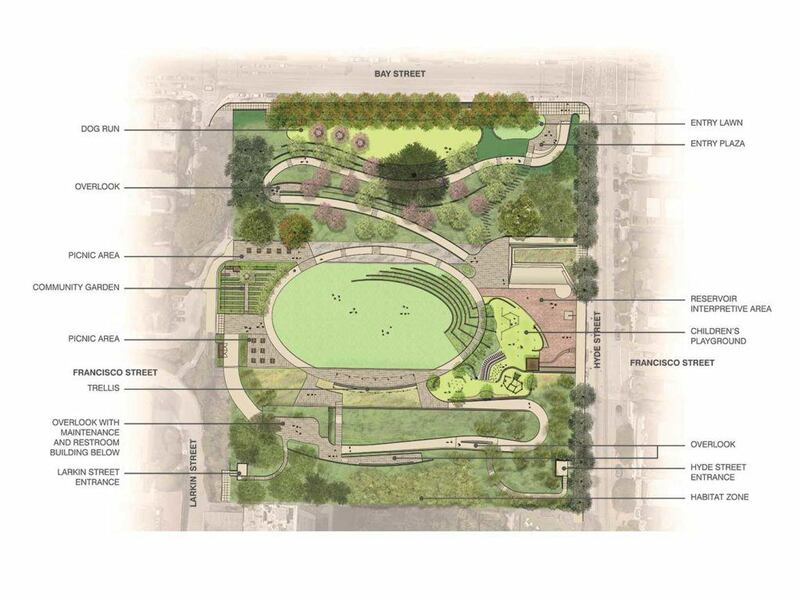 After more than ten years of negotiation with city agencies, community meetings, design explorations, engineering evaluations and more, the conceptual design plan for the new Francisco Park was presented to the San Francisco Rec & Park Commission on March 15 and – in an overwhelmingly positive vote – it was approved! We are grateful to so many champions of Francisco Park who spoke in support of the project at the hearing, including Becky Evans of the Sierra Club, Josephine Ma of Self Help for the Elderly, Noreen Weeden of the Golden Gate Audubon Society, Mike Neumann of Wu Yee Children’s Services, Amber Hasselbring of Nature in the City, and Dr. Joseph Marshall of the Alive & Free/Omega Boys’ Club. The diversity of residents and community leaders who spoke out on behalf of the park demonstrated that this vision is truly collaborative. Finally, we would not be here without Mayor Mark Farrell and his Legislative Aide, Margaux Kelly, who have dedicated considerable time, energy, and enthusiasm to creating a new park for all of San Francisco to enjoy. Their commitment inspires us! We feel so lucky to have Mayor Farrell and Margaux on the Francisco Park team. With the conceptual design approved, the fundraising campaign is our greatest priority. We have to-date raised $8.6M toward our $25M total goal. We are counting on our community to help us complete the fundraising campaign. Please be in touch if you have creative ideas to this end and/or are interested in Francisco Park leadership gifts and recognition opportunities by emailing miegan@franciscopark.org. The success at the March 15 SF Rec & Park Commission hearing was a significant step in our process to turn the dilapidated 4.64-acre Francisco Reservoir site into the new Francisco Park. Thank you for your continued support. Watch for more exciting updates in the months ahead! previous post: Design Update Open House This Saturday, February 10!